We spent this weekend in Atlantic City. My mom, sister and I were all running the April Fools race on the Boardwalk. We decided to try a different resort this year so we opted for the Showboat (which is pet friendly by the way). We are not gamblers so this fact didn't bother us but I feel the need to mention that there is no longer a casino there. This fact made it very quiet as we walked to and from our room all weekend. Showboat is right on the boardwalk. This was our fabulous view! Friday afternoon we did a LOT of walking. We walked up and down the boardwalk and in town to the Outlets to do some shopping. We were both shopping for dress shoes but ended up buying clothes and jewelry instead! Afterwards we walked back to the boardwalk to pick up our race packet at Margaritaville. We were suppose to have a cart waiting for us to take us back to the other end of the boardwalk but it never came so we walked all the way to the other end again to get to Rain Forest Cafe for Dinner. I could tell with all the walking we had been doing that I was starting to get blisters on my toes. This would not be good for race day. Funny Story about the Rain Forest. After we sat down, a young couple was seated across from us. While we were there, several random people would come up to this young couple. A lady even came up to them and asked to take their picture. Of course my mom and sister and I thought they must be famous, but who were they? We didn't know. At first I thought the girl may have been Gabby Douglas, although maybe she was a little younger. Finally a young boy came up to the couple with a piece of paper and it looked like he was going to ask the couple for their autograph. Finally we couldn't take it anymore and we had to know who they were, so my mom was bold enough to ask. Turns out, this young couple was just an ordinary couple (probably in high school) and they were on their first date. The boy that came up to them was his little brother and the lady that asked for their photo was his mom. Turns out his family was seated around the corner. An older couple seated behind us said they were also wondering who they were and were glad we asked..haha. After dinner we stopped at a massage parlor on the Boardwalk (one that we have been to before) and my mom got a foot massage. I could have used one too but I thought I would just wait till I got home because I had a gift certificate to a local place. These were the BEST race shirts ever. SO SOFT. 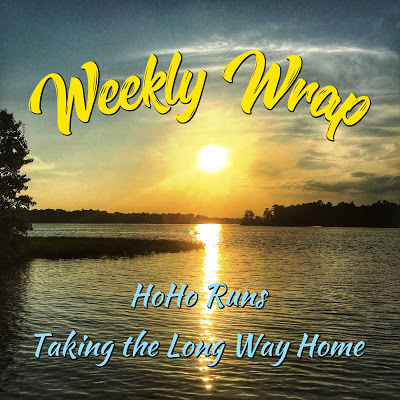 We are linking up with Wendy and Hoho (and Teresa) for their Weekly Wrap! Glad you guys had a good weekend! Its been forever since I've gone to AC. Congrats on a the PR! This race is definitely on my radar! I've heard good things. Congrats on that PR! 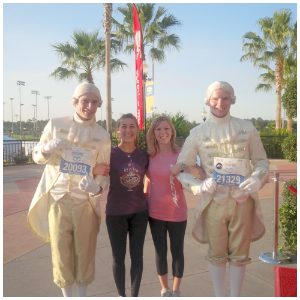 I like running along the boardwalk, thats why I enjoy the race. I think you would like it too. Isn't that funny? It was actually funnier because the people beside us were wondering the same thing and thanked us for asking! I hear such good things about this race, but the weather is usually bad! OTOH I have not done NJ yet. OTOH, it's April, with its showers . . . but outlet stores . . .
Congrats on your PR! A PR, no matter how much, is always a great thing in my book. Out of the 5 years we've done this race, it's only rained one time. It's usually pretty sunny but can also be windy since its right along the ocean. Congrats on the PR! I've never been to Atlantic City but it looks nice and warm! What a fun girls weekend! Congrats on the PR! We don't gamble either but we do like walking on the boardwalk. I do not believe I have been to the outlets in AC. I have never been to Atlantic City but you sure ended up with a great view! I love the name of the race too. Amazing to get a PR after all that walking. Woohoo! Sounds like a fun race and even more fun weekend with your Mom and Sister! Congratulations on the PR ...every second counts! Lol I'm laughing about the 'celebrity' story! I've never been to AC but it looks fun! Such a funny story about the first date! Ha! Once when I was in the airport coming back from somewhere there was a young guy at baggage claim in a tux with a bouquet and a poster waiting to ask someone to prom. There was quite the crowd of curious onlookers! Wow- what an amazing view from your room! It looks so beautiful there. How awkward must that have been for a first date?! I would have been SO embarrassed if my family did that to me. We had a great view and it was super close to the start which is always nice! What a fun sounding race and weekend with fam! Atlantic City looks like an interesting place to visit, even though I'm not a gambler either. Atlantic City has definitely changed a lot from the first year we started running it. That view was fabulous and your race shirt does look super soft! 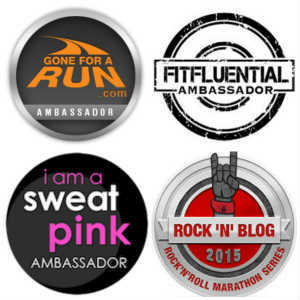 I love soft shirts and tech shirts you can wear while running. Congratulations on your PR!! Congratulations on the PR!! I hope you found lots of good things on sale at the outlets! Now I want a weekend away with my sisters! Sounds like a fun weekend, and congrats on the PR! Whoever was in charge of the race shirts did a great job! Super cute! Congrats on your PR. Sounds like you had a perfect weekend. Oh I love the story of the first date! So glad your mum was brave enough to ask otherwise we would all have been kept guessing, LOL! Congratulations on that PR! Well done and well deserved! I love when races give out nice race t-shirts! I really like those. Congrats on the PR! They were really nice but ran much smaller than years past. Good thing that they offered an easy shirt exchange. What a fun girls' weekend! I'm glad that the weather cooperated for you ladies on Friday and Saturday. It was a lovely couple of days to be at the beach, and the strong races only capped off a great weekend for you all. It was good running weather but it was much cooler at the beach this weekend than it was at home. What a fun race! Glad you guys got a family trip! Sounds like a very fun weekend! Glad that you had a great race as well! I haven't been to AC in a few years but would love to go down for this race. I love that race shirt, too! What a fun weekend to spend together; am still laughing about that date with the "famous" people, LOLOL. Is it called the April Fools race because it's not on April Fools Day? Like a joke? Congrats on your personal best! I've never been to AC, and I know a non-casino would be great. I'm glad to say the SLS was quiet when I was in Vegas, which is always a plus in a hotel.